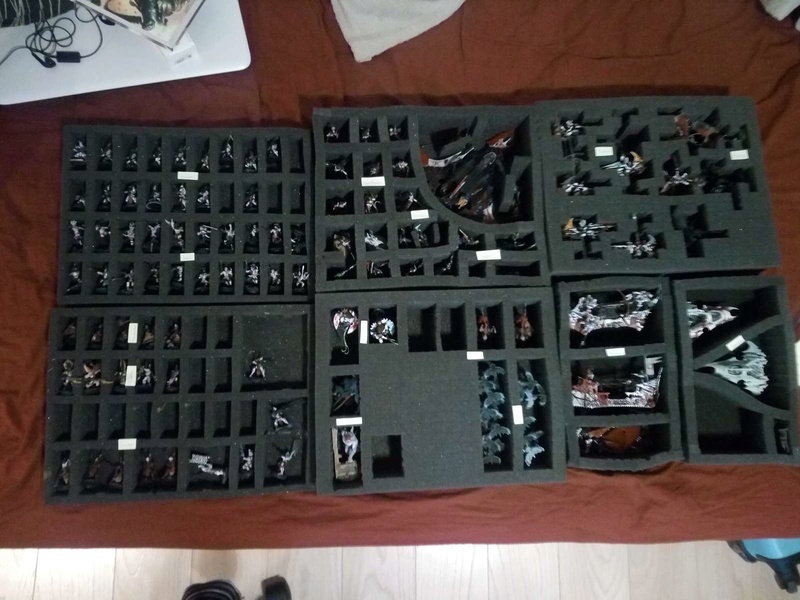 Been tired of unadapted casing for my DE army (let's be honest, we mostly don't fit in SM squares), I've just bought some foam casing from hobbymax example and it's kinda a pain. I've bought several pre-cut pre-glued layers and also separation foams (~10mm height foams) to glue on, but I find it really hard to get to what I want. A friend of mine adviced me to cut through before gluing, but it's really a pain (especially for 60mm height for raiders), as it's hard to cut through, and some glue stay on the cutter/knife, and the more I cut in, the more it become fragile. Any advices or recommandations ? I wouldn't glue the bottom sheets until you make your cuts . If you have a dent exacto knife you should be able to make short work of the foam. To keep the glue off the knife boil a pot of water and dip the knife in between cuts (should melt the glue right off). Trace out where you want to cut then try to keep the knife as straight up and down as possible... takes some time but it's worth it keeping your minis safe. Already did most of the casing and I'm really happy with it, especially with the 60mm height ones. I've cut most of it to do the first casing, then re-used the parts on separator layers to add 2 more at minimal costs.^It took me roughly a full afternoon (6-8 hours). No more bending, and it's much more organized now. I really recommend getting away from GW basic casing.